Last summer this was by far my favourite breakfast. And as temperatures are improving, it’s back on the reperoire. It’s really simple to make (always a plus) and you can add what ever kind of berries you like or have to hand. It’s also makes nice gluten free breakfast option, if you feel you need a break from smoothies or perhaps your usual egg based breakfasts. What truly makes the difference here is the the banana. Not only for taste, but truly for texture! Buckwheat has a strong flavour and it also tends to have a very gritty texture if blended on its own. Adding the banana truly was the game changer! So what’s the deal with these tiny little tetra grains? What’s to gain by introducing buckwheat into you life? 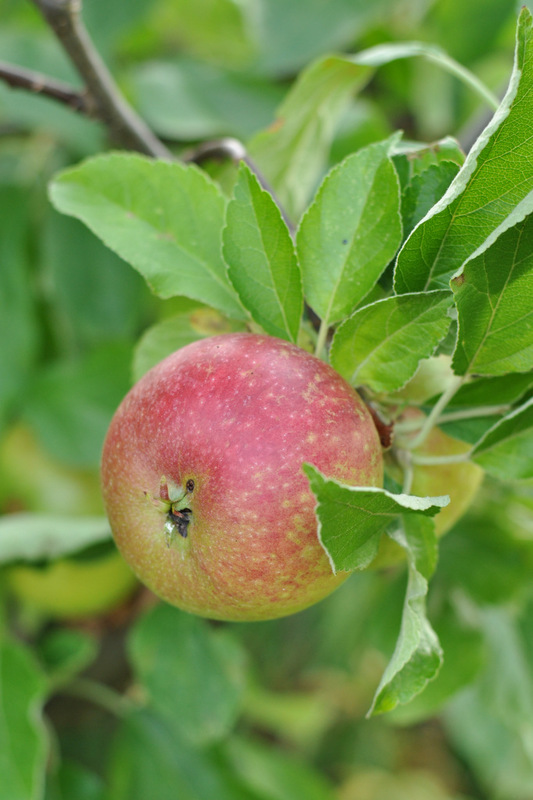 The seed itself is high in the phytonutrient flavonoid compounds quercetin and rutin which are two powerful antioxidants which has been shown in some studies to have a positive effect on relieving the symptoms of hayfever and asthma. 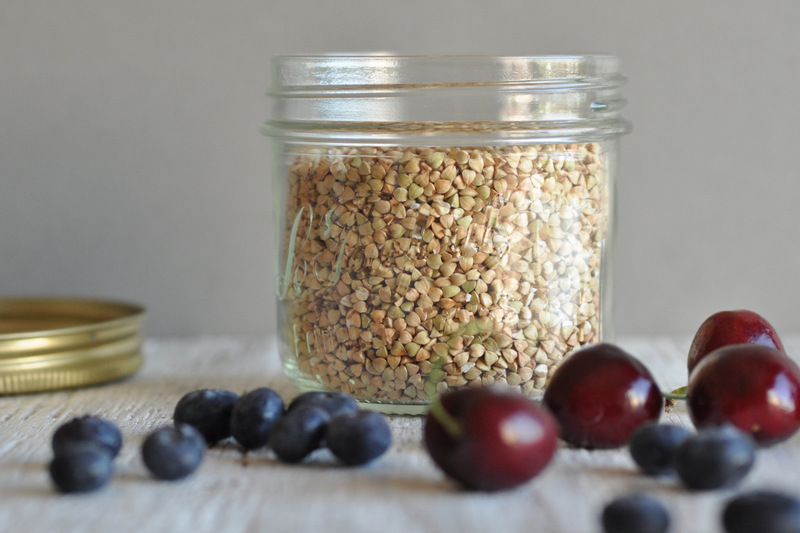 Turns out buckwheat is also a very good source of magnesium which is an important mineral for cell energy production and often an electrolyte which can be deficient through sweating (hello hot summer weather!). Muscle cramps are a fairly reliable symptom of magnesium deficiency. Magnesium is also an important mineral to protect our heart (which is a large muscle). Stress and high refined sugar intake can easily deplete our stores, so it’s important to make sure you get enough of it through your diet. Other great sources of magnesium is kelp (seaweed) almonds, cashews and leafy greens like parsley. 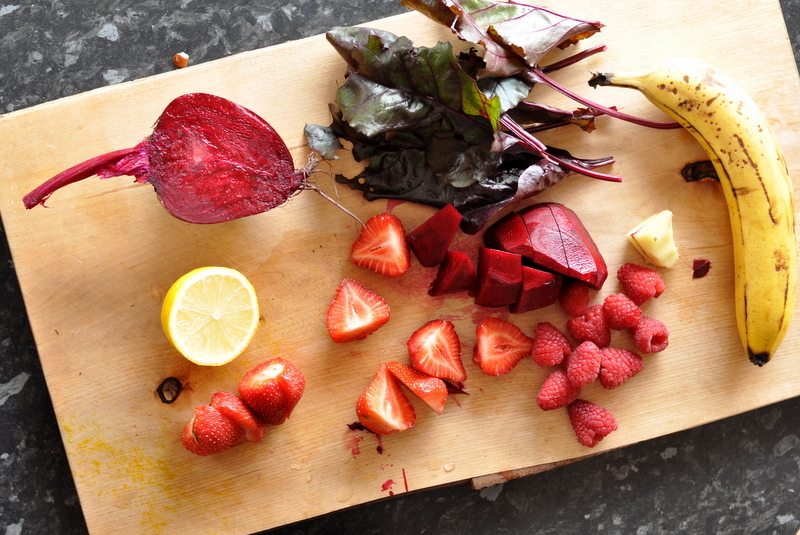 Adding more wholefoods to your overall diet can only mean overall improvements to your health and wellbeing. It’s all to easy to get stuck in a food rut so by increasing the variety of food you eat mean that not only do you have a greater chance of getting all your nutritional needs covered through your diet, it also gives you an opportunity to become more creative with your cooking (and eating) which in turn it may even help you become more expansive in your thinking! And who knows where all that creativity and expansion may lead?! Variety truly is the spice of life! Fresh berries of choice – I used blueberries and cherries here but strawberries, raspberries or any type of currants would be delicious too. 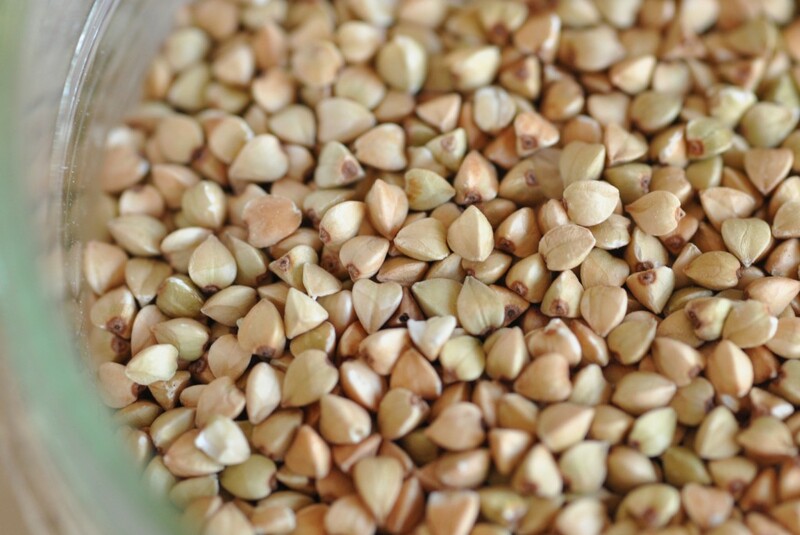 Soak the buckwheat groats in water overnight with a splash of lemon juice or apple cider vinegar. This will make them nice and soft for blending and starting the sprouting process, making the easier to digest. Drain your soaking water and then rinse of the goey stuff (which is completely normal) well before your place the groats in your blender together with the banana, coconut milk and spices. Blend for about 30s until you have a lovely creamy “porridge”. 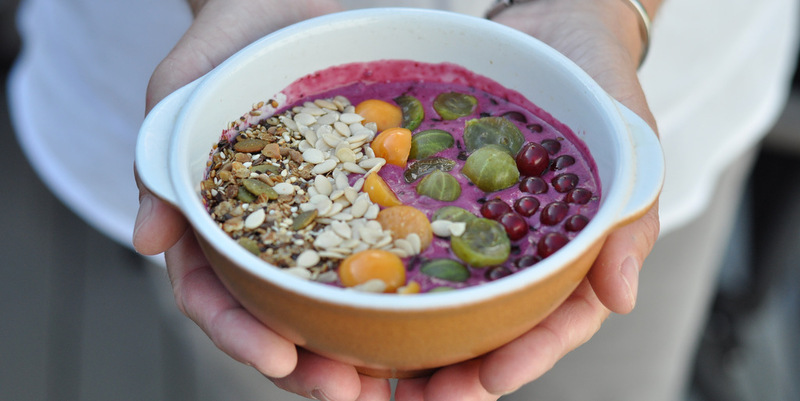 Serve immediately in bowls with your choice of toppings. Note: If you want a really cold porridge use a sliced, frozen banana. I normally have mine at room temperature with a fresh one though. But either way, the banana will make a huge difference to the consistency so I wouldn’t leave it out. 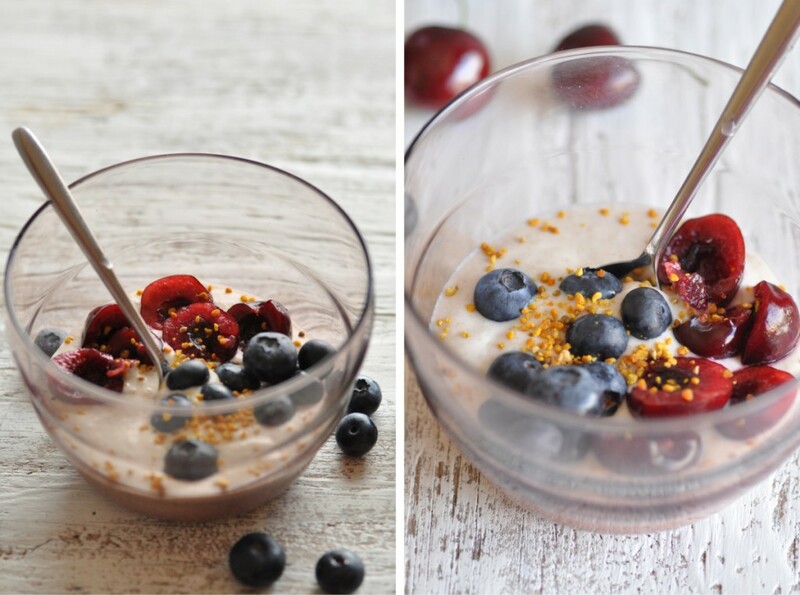 Looking for some more buckwheat recipes? Here is a cooked breakfast option. And here is some crêpes. Oh and a delicious smoothie from Cashew Kitchen! This recipe has sat in the draft section for some time. Turns out posting it now, is good timing still, because it could easily work as a nutritious addition to your menu over the holiday season. 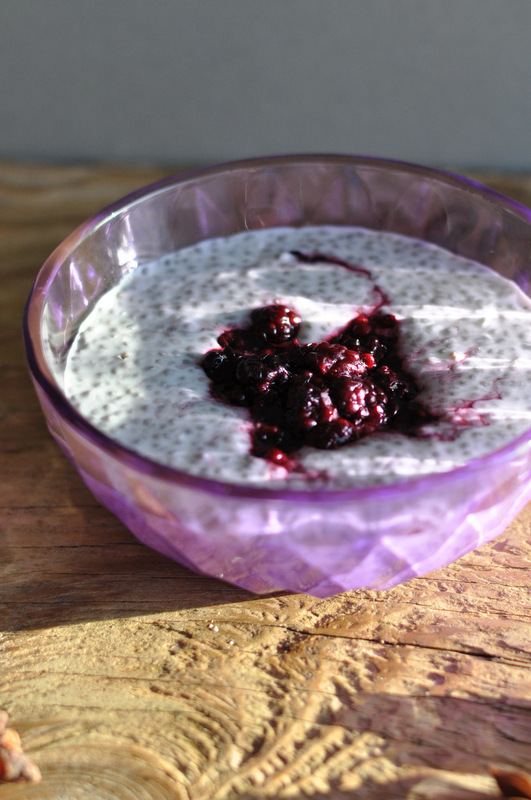 You may have heard of chia puddings by now. You may even be a big fan of them. If you haven’t you are missing out of one of the easiest, nutritious snack/dessert /breakfast ever! 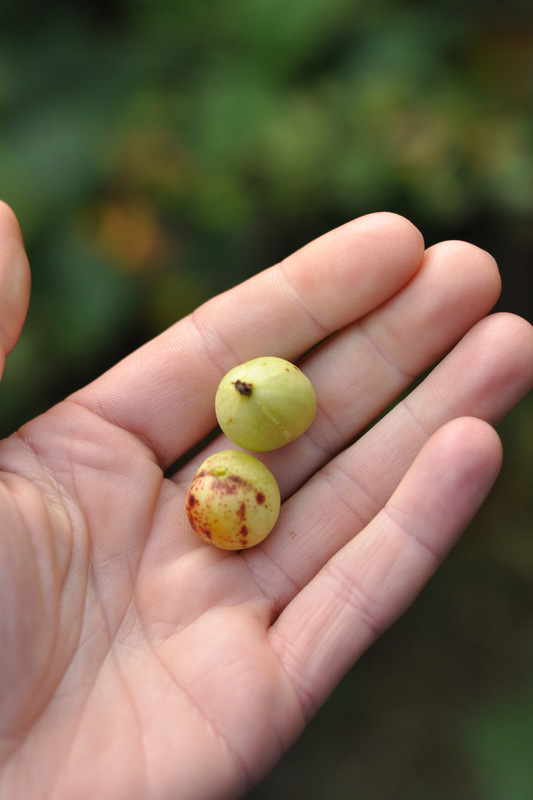 I remember a few years ago when these tiny little seeds appeared on the shelves in the health stores and no one had really heard of them, let alone knew what to do with them… These days they are big news! Turns out they are a good source of plant based omega 3 essential fats. 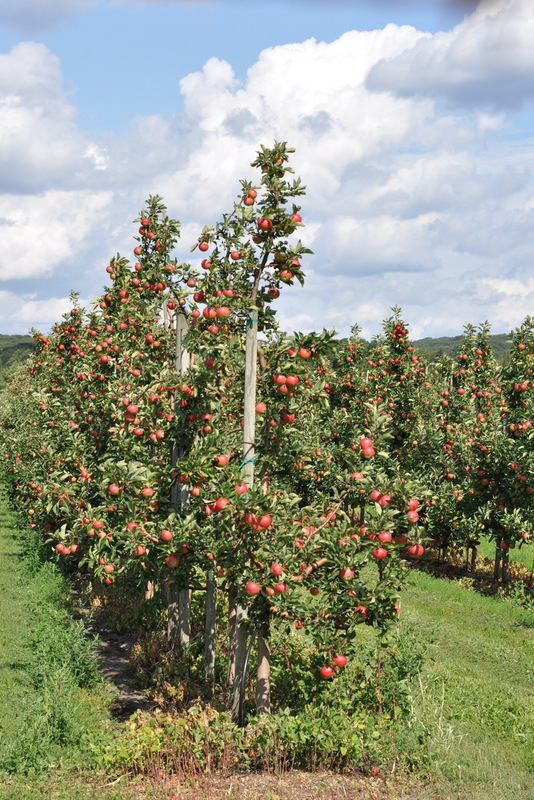 They are also high in fibre, potassium, zinc, calcium and phosphorus. I think in those early days, no one really had any clue how to eat them or how to make them taste nice. Thing is they swell a lot in any liquid you leave them in, and when they do, turns out they don’t look all that appetizing… The very first time I tried chia seeds it was a tsp of seeds soaked in plain water, just swallowed down. Not the most exciting thing I’ve ever eaten to be honest. Obviously times has moved on – enter Chia Pudding! I’m not sure who originally came up with the bright idea of serving the little guys this way but let’s just say it’s genius! Their ability to gel makes for a nice consistency and when you eat them in this way they can actually help with constipation rather than hinder it. I have tried lots of different types of chia puddings at this stage but using a good quality full fat coconut milk is by far my favourite. It even reminds me a little of the Christmas dessert we have back home, rice pudding, well actually more like the cold version of rice pudding; Ris á la Malta. Here you have a slightly healthier version made with just two ingredients: Chia Seeds and Coconut Milk. I’ve chosen to top this pudding with some winter spiced berries. Here I used the blackberries we picked back in the autumn. Grateful for the abundance back then and for the freezer now! If you, like me, live in the Northern Hemisphere where berries are not in season, then use frozen ones. I’d imagine blackcurrants or blueberries could work to. 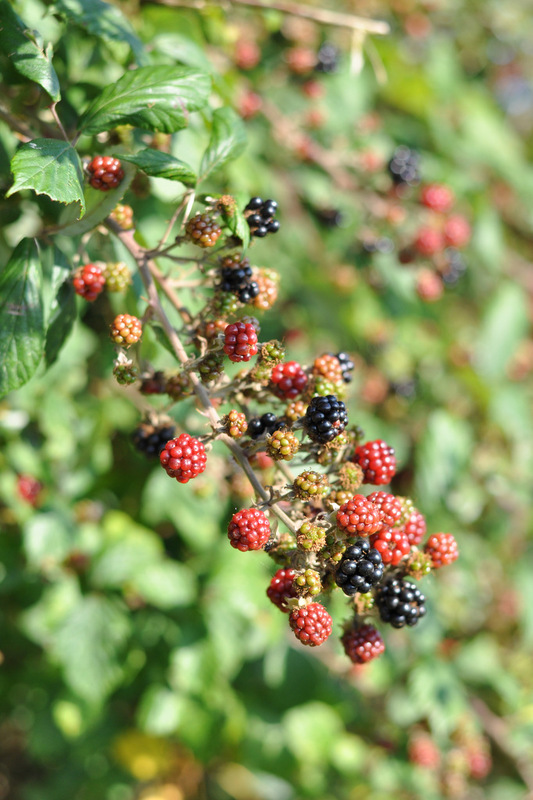 And if you live some where were it’s berry season, well then make the most of it and use fresh ones! 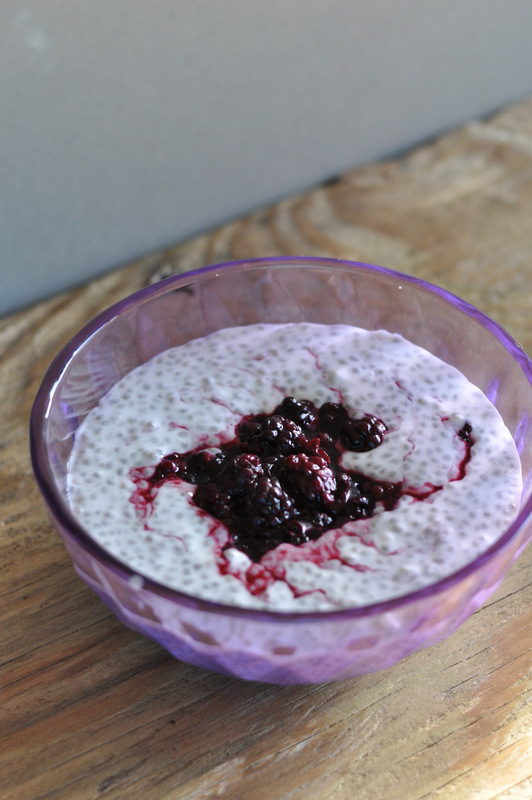 To make the pudding; mix coconut milk and chia seeds together in a small bowl. Make sure it is well mixed together and stir a few more times over the next five min, to remove any lumps, as the seeds start to absorb the liquid. Then move to the fridge and let it set over a few hours. 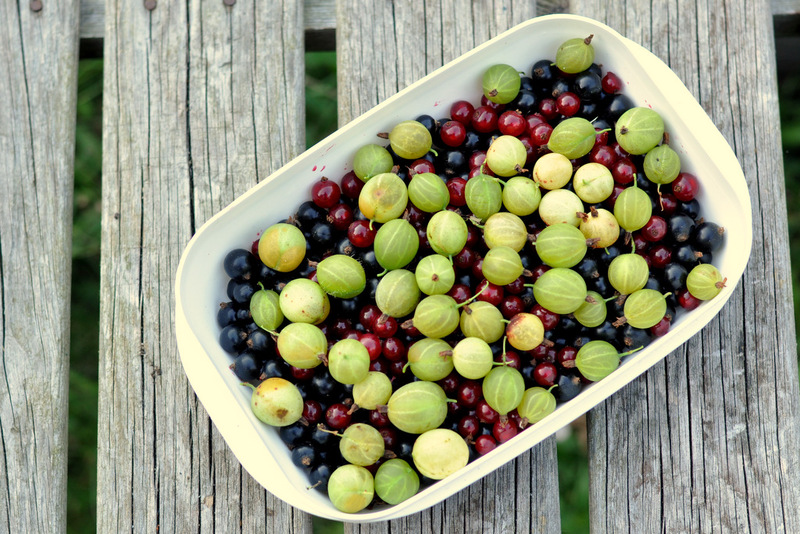 To make the berry compote; place the frozen (or fresh) berries in a small sauce pan. Add in maple syrup, ground cinnamon. Gently toss the berries in the maple syrup and spices until evenly coated. Add in the star anise. Bring it slowly to a simmer and let it simmer away for about 10 min until fruit is soft and the compote is fragrant. 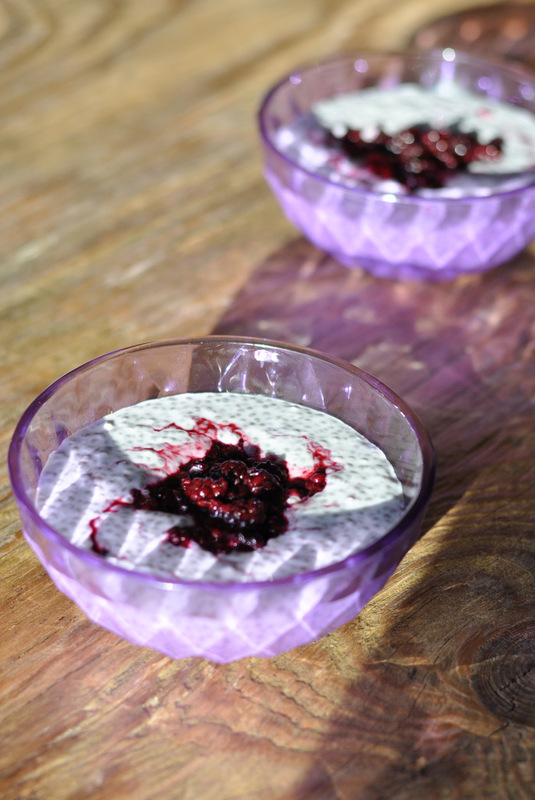 Serve the chia pudding in small bowls with topped with the warm spiced berry compote. N.B This dessert (or even breakfast!) is very filling and not very sweet. You can omit the maple syrup if you are looking for an even lower carbohydrate load. P.S. I hope you don’t mind me throwing in a picture from the beautiful autumn we had. Worth a reminder of brighter days to come as the longest day of the year fast approaches. 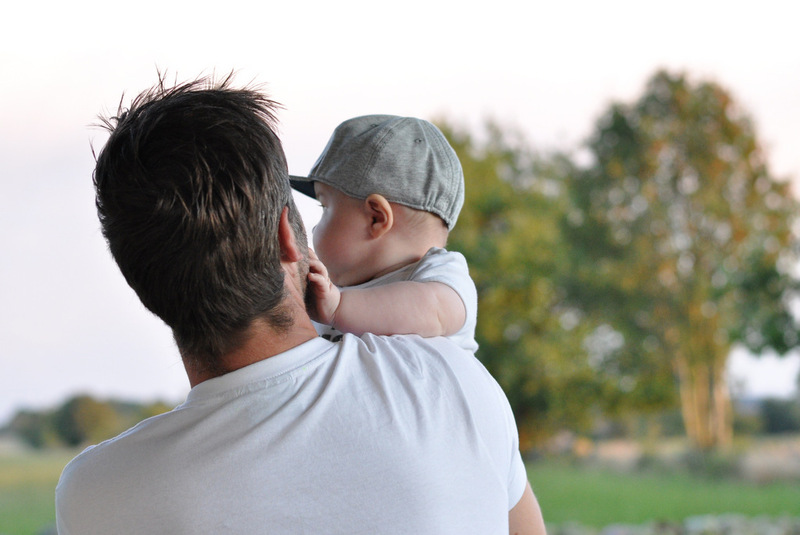 Holidays are over and it’s time to get back to normality… If you have kids I am guessing you are in the midst of preparing for the return to school. Even though it is years (many years in fact) since I went to school, this time of year always reminds me of just that. The sense of that first light chill in the air, the sweet smell of grain ready for harvest and just the beginning of a hint of red on the leaves. Then you know that change is in the air and that we are slowly moving towards darker times. Summer is drawing to a close… Both with a little sadness, yet with a light exciting anticipation of what may lay ahead. I came back from my long awaited holidays earlier this week. And boy am I feeling the change in the air! When you live abroad, “going home” is almost a necessity. Kind of a given way to spend some of your hard earned time off. This is my 13th year abroad and every summer I return faithfully to my roots. Luckily I have a loving home to return to every year and since my beloved mother lives in one of the most beautiful places on earth it makes the endeavor an even sweeter one. About ten years ago she moved to the most southernly area of Sweden, Österlen. It is so close to the sea and one of those special places with special light. This area of Sweden has been home to painters and artists for centuries. If you have ever visited, it is obvious why. You will find art galleries, vintage stores and artisan cafés dotted all over the place. This is not where I grew up though. 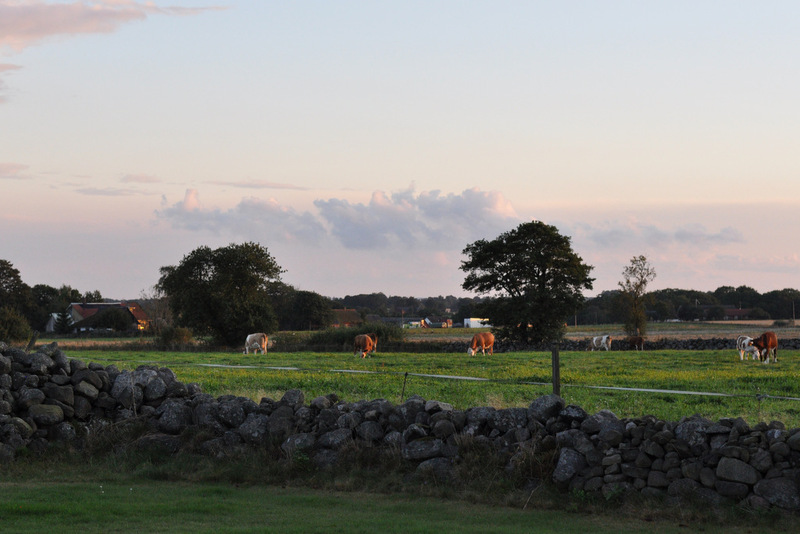 My “real home” is smack bang in the middle of Skåne, with a slightly different landscape. Different but still beautiful. My dad and his family come from this particular countryside and my darling brother is set to carry on the tradition, having built his house here and having started his own family earlier this year. This post is slightly different to my usual ones as I would like to share some pictures I took whilst I was home, in Sweden. I sincerely hope you won’t mind. If you have never visited this corner of the earth, hopefully a few images will inspire you to do so! 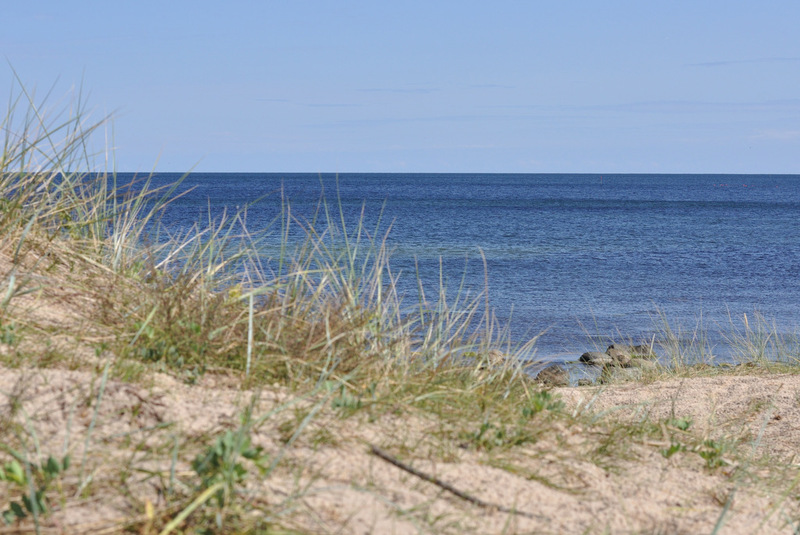 Most of the coastline is scattered with small sandy beaches and the Baltic can be very warm with water temperatures reaching the mid 20s if the summer is a hot one. I manged just one dip while I was home but I doubt it was still mid 20s kinda warm. It didn’t really feel like it was! It truly is a summer paradise around here and judging from the amount of tourists still around, a lot of people seem to think so. The area is actually equally beautiful in the winter, but much much colder so hardly any visitors to be seen anywhere then. I’m sure the locals don’t mind the peace and quiet over the winter months, though. They must be worn out after the summer. When I first moved overseas, there was a whole heap of foods and dishes I missed. Since then, my dietary habits have changed, a lot. Much for the better, I suppose. So now I miss cooking when I’m away instead. There are still a few foods which find their way back to Ireland every time though. Things like REAL traditional Swedish rye crispbread and “Kalles Kaviar”, a caviar in a tube. Might sound rather awful to some… But not if you are a true Swede 😉 Anyone with me? Have you tried it? 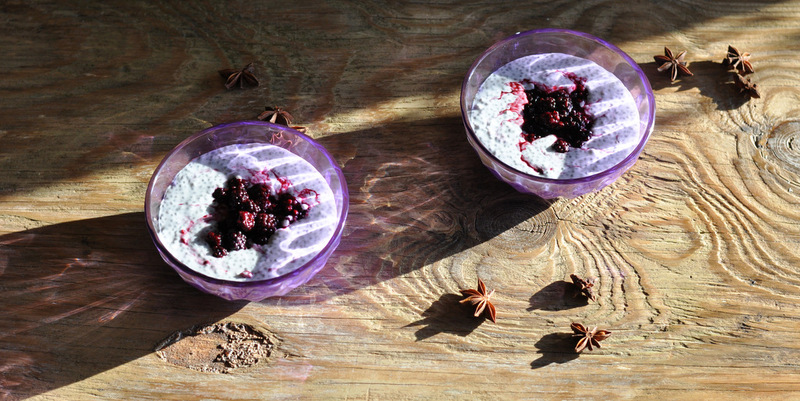 The recipe here is a delicious purple smoothie bowl made with blackcurrants foraged from my mother’s tiny little kitchen garden. I simply adore blackcurrants, so enjoyed the opportunity to pick them straight from the bush as oppose to a freezer bag for a change. 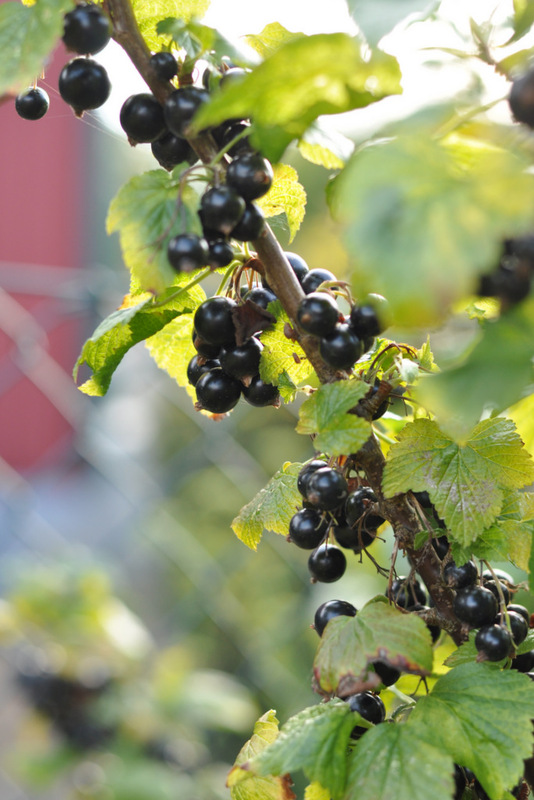 Blackcurrants are a true super food which we, who live in the northerly latitudes can enjoy locally. It has as much vitamin C as goji berries so a perfect berry to store for the winter months to stave off any colds and flu bugs. 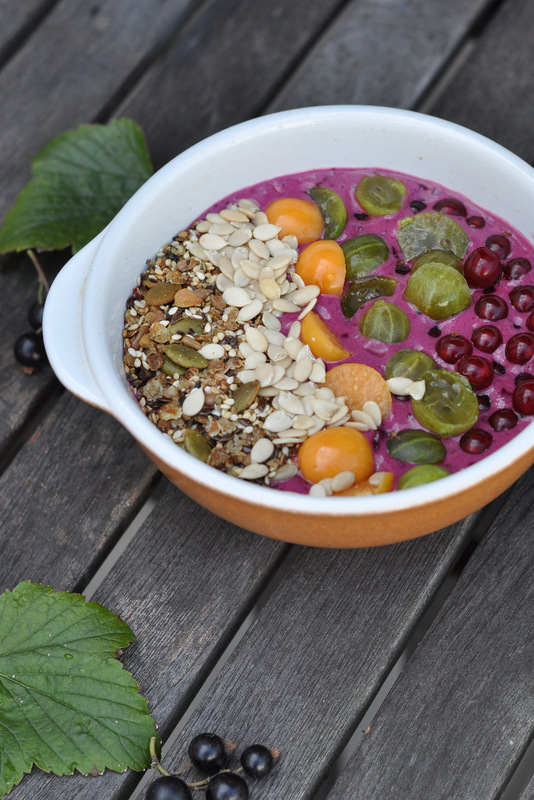 When I was in my late teens and still lived in Sweden I had never even heard of a dairy free smoothie bowl, like this recipe. Fast forward ten years or so and they have become a weekly staple. How things change, hey? Smoothie bowls are so handy when you are looking for something which resemble that bowl of yoghurt with cereal you used to eat before you had to clean up your act. 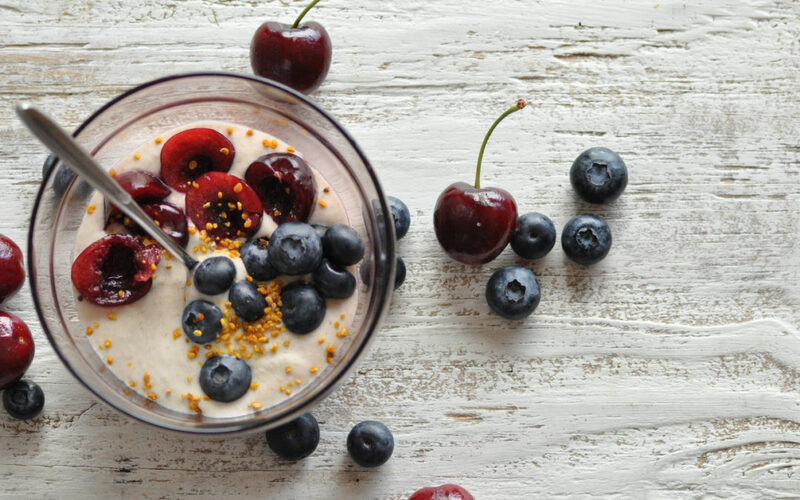 When I finally realised that my body felt so much better without dairy and had to give up my beloved natural yoghurt, having my smoothie in a bowl at times has made me feel a little less deprived. Now I can top it with with crunchy seeds or homemade granola just like I used to when I was 12! 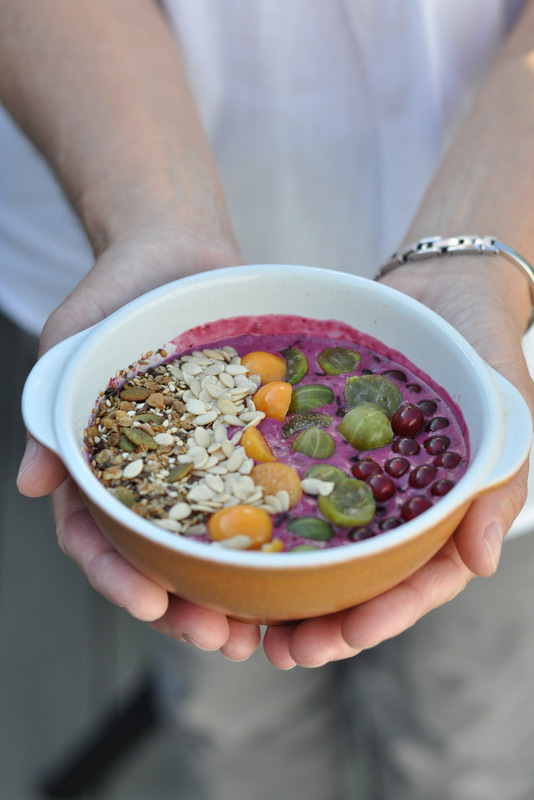 The fact that this kind of breakfast bowl will give you less sugar and more nutrition than traditional ones, makes it even more worthwhile. Rinse and drain the berries if using freshly picked ones. 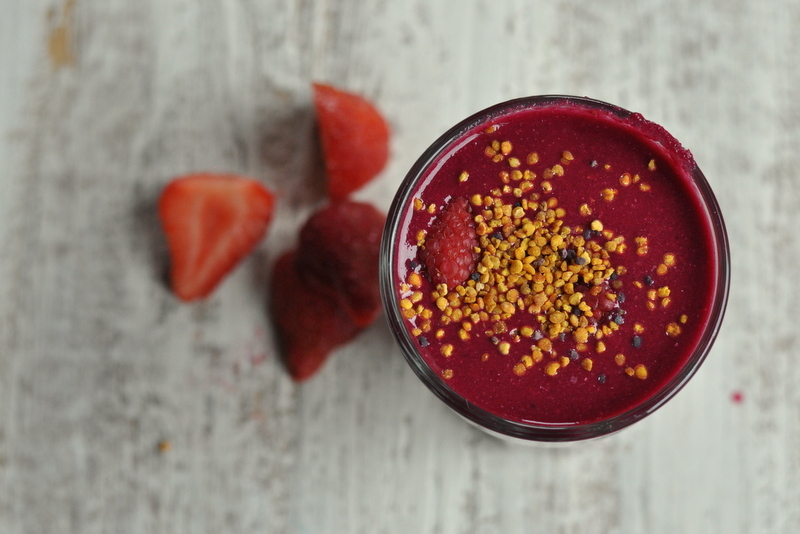 Place berries, coconut milk and banana in a blender and blend until smooth. Serve immediately in a bowl and top with your favourite muesli, granola or toasted seeds. Add more berries if you so wish. I like the rather tart taste of the berries so for me the banana is enough to sweeten. You can of course add a little honey or maple syrup if you find it too tart. However I would recommend not to, if you wish to keep your sugar intake low. If you wish to try another smoothie with coconut milk, check out this recipe which I made for this site a little while back. A seriously refreshing summer drink. If you can get hold of some water melon and strawberries, it’s worth trying. Promise. Well, are you ready for autumn now? I don’t know if I can truly say I am. It will be here whether we want it or not though, so we might just embrace it… But until it is inevitable, I for one will savour what’s left of the summer and the lovely memories of the past few weeks spent with old friends and family. Grounding and reconnecting with my roots. How about you?